2. For the chocolate cookies: Place flour, cocoa powder and baking powder into a mixing bowl and whisk together. 3. In the bowl of a stand mixer, fitted with a paddle attachment, cream together butter and both sugars. 4. Add peanut butter and continue to cream together. Scrape down sides of the bowl, add egg, milk and vanilla and continue to mix together. 5. Add dry mixture to the wet ingredients, in thirds, mixing after each addition. 6. Add the melted dark chocolate and continue to mix together until a dough forms. 7. For the peanut butter filling: In another mixing bowl beat together the peanut butter and powdered sugar until completely combined and no lumps remain. 8. 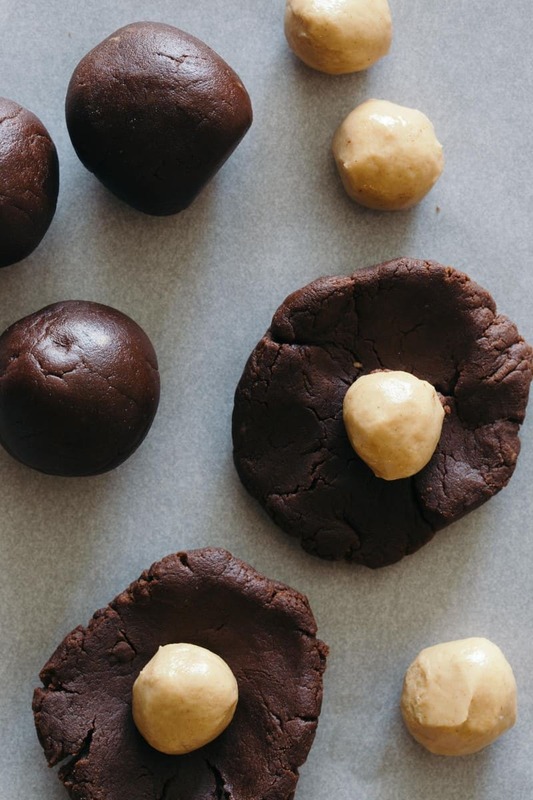 To assemble: Take 2 tablespoons of the chocolate cookie dough and form into a flat disc. Take 1 1/2 teaspoons of the filling mixture and form into a ball. 9. Place the peanut butter ball onto the center of the chocolate disc and carefully wrap the disc around the ball, until completely and evenly covered, pinching and sealing any visible openings and cracks. 10. 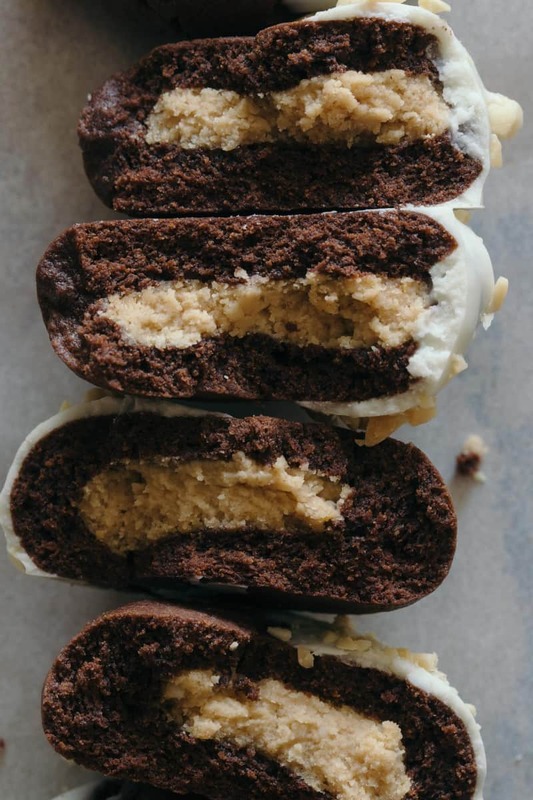 Roll the peanut butter stuffed chocolate ball to make smooth and place onto a parchment lined baking sheet. 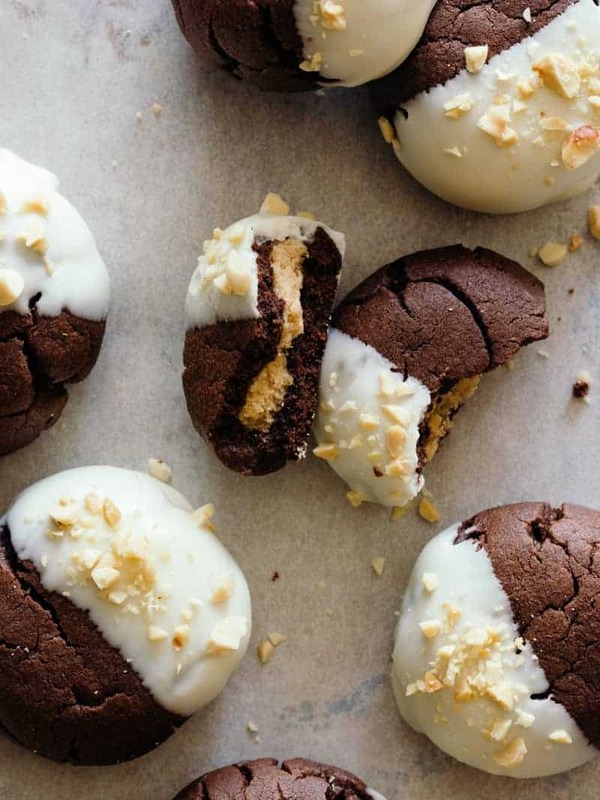 Repeat until you have filled 2 to 3 baking sheets with chocolate cookie balls, spaced 1 1/2 inches apart. Using the back of a lightly greased measuring cup, gently flatten the tops of each cookie. 11. Bake cookies (no more then 2 cookie sheets at a time) for 8 to 10 minutes or until slightly puffed up and baked through. Remove from oven and transfer cookies onto a baking sheet lined with a cooling rack. Cool the cookies completely, about 1 hour. 12. 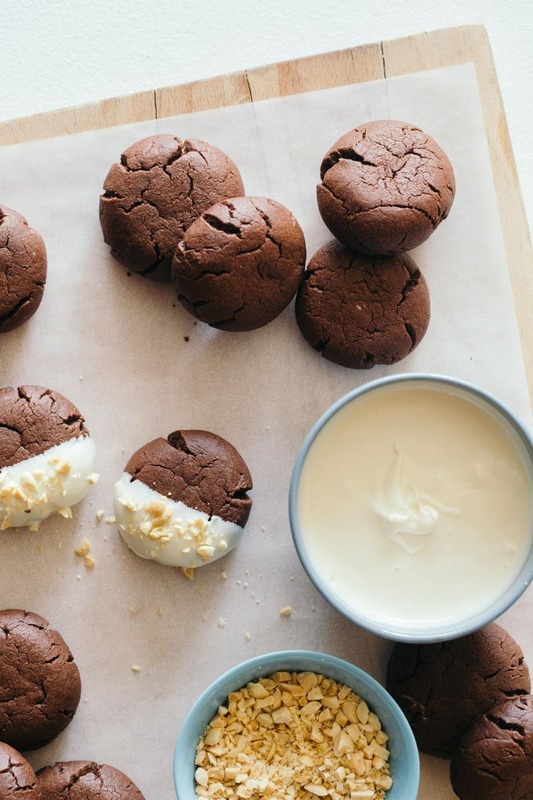 Once cookies have cooled, dip half of each cookie into the melted white chocolate, gently shaking off any excess. 13. Gently place dipped cookies onto a parchment lined baking sheet, 1/2 inch apart and sprinkle with chopped peanuts. Allow white chocolate to set, about 30 minutes. Serve. **Cookies will stay fresh for 5 to 7 days when stored in an airtight container, in a cool and dry place. I think that these are the sort of cookies that are going to get me in trouble… YUM! So much goodness in one cookie!! This looks great! This is literally all my dreams coming true. Can’t wait to try them! These look incredible! What a great idea! The peanut butter/powdered sugar ratio for the filling seems to be off when we made ours. We needed to add extra peanut butter.